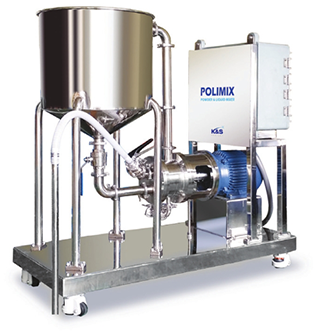 Unlike other mixers, POLIMIX is designed for special purpose which is powder suction. Rotating at a speed of 3500 rpm, 2 blades for dispersion and suction have been designed in certain angle with a large diameter which will inhale and disperse the powder without any scattering. However, since this structure is designed to receive a large amount of load, the valve needs to be closed and the speed should be reduced to 2500rpm when the suction process is finished. During the state where the powder valve is closed, meaning during the liquid circulation state, the temperature of the liquid increases due to the fact that power of dispersion becomes excessively strong. In such situation, the power of the motor(Horse Power) doubles just to cover the overload, which increases the electricity consumption and operating costs, in turn, decreases the efficiency of the procedure. Therefore, for safer usage and excellent quality of dispersion, understand the mechanism and pay attention to the RMP display in the controller and adjust the RPM accordingly when in use.